Fred Perry has launched its Exhibition footwear range, which is good news if you are looking for a retro tennis shoe. From out of the swinging sixties comes the Lacoste Rene Espa tennis shoes, reissued as a exclusive Size? reissue. Available in two colour options (the other is pictured over the page), the shoe is a reworking of the classic 1963 tennis shoe, now with an espadrille outsole with hessian highlights, a canvas panelled upper and Croc branding woven on the side. There's also a branded insole and a contrast striped panel stitched down the heel. Limited numbers, £54.99 is the asking price. We flagged these up some time back, but after some weeks, the Le Coq Sportif x Hanon Arthur Ashe Premium trainers are now available to buy. If you missed them back then, this is a remake of the classic 70s/80s tennis shoe, made for US tennis legend Arthur Ashe. 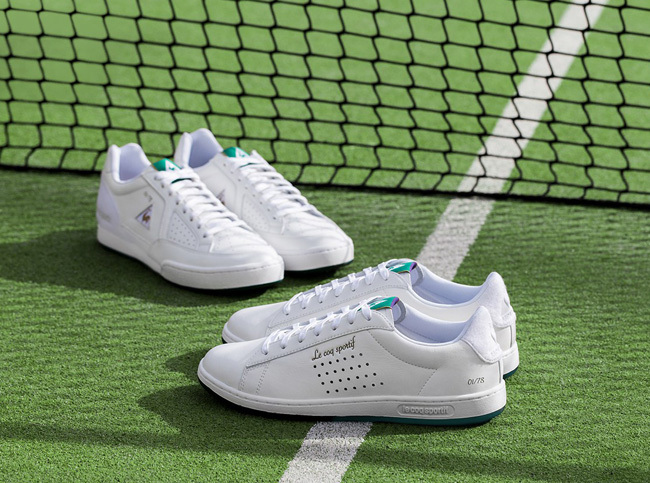 It's a premium edition too, made to high standards at the Le Coq Sportif factory with the support of the Arthur Ashe Foundation in New York, which will also get some of the profits. It's also limited to just 100 pairs worldwide. So you might want to get in quick if you want your size.